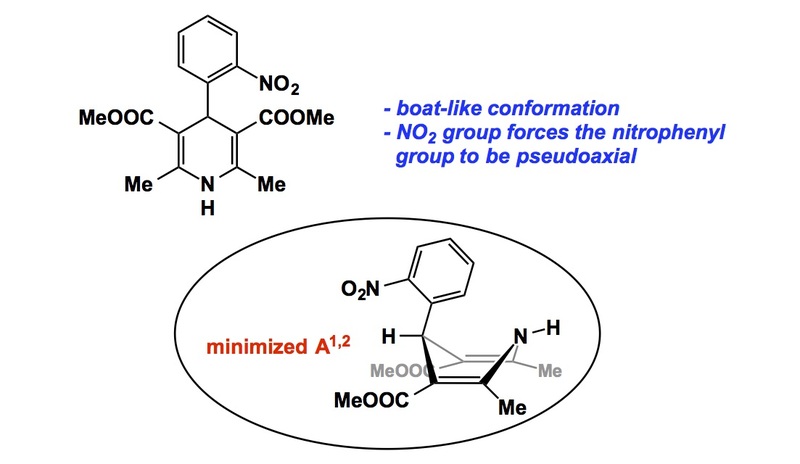 There has been a lot of discussion about Perola’s claims that 60% of drugs do not bind their targets in a local minimum conformation (http://pubs.acs.org/doi/abs/10.1021/jm030563w). Many people have challenged this viewpoint, saying that it is as an artifact of errors of crystallographic analysis. While I am still not sure which side of the debate I am on, it is good to remember that innate conformations of organic molecules are governed by a few well-understood principles. Let’s talk about allylic strain and its relevance to biological activity. Earlier today I was wondering about cases that display powerful, yet subtle, “allylic control” over bioactive forms. If such occurrences could be traced to (hopefully) one correctly positioned substituent, a particularly good lesson might be served. I looked through my vault of papers and retrieved a classic on dihydropyridines, which are celebrated calcium channel blockers (http://onlinelibrary.wiley.com/doi/10.1002/anie.199115591/abstract). Take a look at Scheme 12. Here we have an awesome manifestation of A1,2-strain that “pushes” the nitrophenyl group in axial orientation. Incidentally, the NO2 portion of the molecule is not some innocent by-stander. This group enforces adoption of the desired conformation, which is why I love this example: the conformational control can be attributed to a small group.